Tokyo, December 25, 2014 - Fuji Heavy Industries Ltd. (FHI), together with Subaru Tecnica International Inc. (STI)*1, announced its exhibition at the upcoming Tokyo Auto Salon 2015 with NAPAC (Japan Car Parts and Aftermarket Promotion Association), which will be held January 9th to 11th, 2015 at the Makuhari Messe in Chiba prefecture. At the Subaru booth will be design concept models such as the "Legacy B4 Blitzen Concept", "Subaru XV Sport Concept" in addition to the "Levorg S Concept" tuned by STI. With these models, Subaru shows pleasure of customized units. The "WRX STI NBR Challenge 2015", a new racing car for 24 Hours Nürburgring endurance race in 2015 and the "Subaru BRZ GT300 2015" for Super GT race will also be exhibited. At the press conference on January 9th, 2015 Subaru Motorsport Activities will be announced. 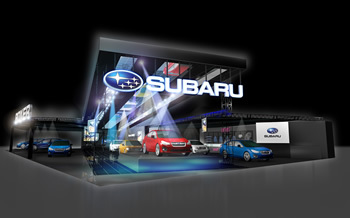 The special site for Subaru Auto salon (http://www.subaru.jp/tas2015/) will be opened. *2: Ustream is a live video streaming website operated by Ustream Asia Inc.
Based on the Legacy's muscular styling with a high quality feel, the model inherits distinctive design concept of the previous Legacy Blitzen series, featuring a character as the Subaru's flagship sedan. The "Premium Red", an iconic exterior color for the Blitzen series has been employed. In addition, its wide and low front silhouette represents a Boxer engine while wheels and a rear spoiler evokes powerful driving performance. On the interior, piano black finishes and red lines coordinated with the body color accent the beige colored leather materials. The Blitzen is a design concept model pursuing simplicity and functionality. The vivid "Sunrise Yellow" colored Subaru XV with lower ride height is equipped with yellow striped spoilers, delivering sportier character. In contrast with bright yellow, black colored grille and wheels achieve bold styling. Its black interior has yellow stitches harmonized with the body color, appealing enhanced sportiness. This design concept model enhances the Subaru XV's "casual & sporty" character to accentuate one of the Subaru's distinctive value, "Enjoyment". The Levorg S Concept embodies the philosophy of "S series", STI tuned flagship model, in its "Sports Tourer" styling. With the parts exclusively tuned by STI including intake and exhaust parts, 6 speed manual transmission has been teamed with the 2.0-liter Horizontally-Opposed direct injection turbo "DIT" engine which produces impressive performance. In addition, by employing STI’s unique flexible parts such as a tower bar, chassis and body performance has been further enhanced, delivering superb ride quality, stability and exhilarating handling performance. As the STI tuned flagship model, the Levorg S Concept also pursues the ultimate in driving enjoyment and pleasure of ownership.